A new paper out today from Deloitte called ‘TV+: perspectives on television in words and numbers‘ which covers some subjects close to my heart. I was particularly pleased to be invited by the Guardian to appear in some brief podcasts discussing it (along with Tess Alps from ThinkBox, George Entwistle from the BBC, Richard Welsh from Bigballs Films, Sally Quick from UKTV, James Bates & Paul Lee from Deloitte, all chaired by the brilliant Aleks Krotoski). The PDF itself is secured, making it hard for me to copy and paste some choice quotes for you. Oh well. Here are some rough notes anyway. TV as “the super medium around which all others revolve”. Increased opportunity to watch TV thanks to increase in access to mobile devices, apparently. Hmm. My view is that just because someone can watch TV on a small screen doesn’t mean they will always want to. I’d expect mobiles devices to be largely used for clip-snacking rather than people watching 30 minutes of TV on the move (though no doubt there will be some more of that too). Colour e-ink capable of fast refresh rates. (Imagine something like a Kindle, but in colour and capable of video.) This will indeed be amazing. I’m still not sure we’re going to be watching whole episodes of X Factor in the park though. Personally, I think the power of mobiles will not be in watching TV, but as a second screen allowing you do browse, chat, buy etc simultaneously and individually, without cluttering up the big shared living room screen. Million Pound Drop had an online game (by Monterosa for Channel 4) allowing you to play at home. With good on air calls to action they had 12.4% of the TV audience simultaneously playing on their second screen. For advertising, things like the Honda Jazz app and the Heineken ‘Star Player‘ game are just the start. “Social networks and television complement each other” Couldn’t agree more. Both for TV makers and advertisers, the opportunities here are massive. Popular programmes are what drive social chatter. – I can certainly confirm that producers and commissioners are very interested to know “did we trend on Twitter last night?” But some interesting ones are thinking about how to make sure their programmes work well online too. Seven Days was deeply flawed in many ways, but a format that tried (and arguably succeeded) to ensure people would talk about it and share it online. The BBC, too, puts a lot of effort into helping people know where the online conversations are happening online (whether it’s linking to the buzz about each programme from its official web page (like this), or putting a hashtag on screen at the start of certain programmes). 35x more time spent watching TV than using using social networks. (more people are watching TV, and for longer, than using social networks). This is probably the fact with which TV execs in Edinburgh will be reassuring themselves in Edinburgh this week. I’m not sure this helps us understand the underlying patterns though, for two reasons. First, because TV viewing figures measure “presence rather than attention” (to quote the brilliant Matt Locke), and time spent watching TV is very different from time spent conversing, sharing, creating, etc. And second, because the average time spent online is not a particularly useful measurement. I’ve been re-reading Clay Shirky‘s Here Comes Everybody recently. He writes “the most active [in social systems such as Wikipedia and Flickr] tend to be much more active that the median participant, so active in fact that any measure of ‘average’ participation becomes meaningless. There is a steep decline from a few wildly active participants to a large group of barely active participants, and though the average is easy to calculate, it doesn’t tell you much about any given participant.”. Conclusion: “Television and social networks could each exist independently of each other” … but “the two media are strongest when working in parallel”. Yes. PVRs: people think they’re watching fewer adverts but actually, they’re watching more. (As with ‘TV is not going away’, this is actually something people have known for a while.) It’s a good fact though. 47% of 16-24 year old PVR owners always, frequently or occasionally stop fast forwarding through ads if they see an advert or trailer that interests them. – Interesting to think of opportunities to develop advertising that works well on PVRs. A three minute spot, with 18 seconds of film played out at 1/10th normal speed, would be really annoying unless you were fast forwarding it. Let’s not make one of those. I dispute that claim that YouTube is now “focused on professionally produced content, with television programmes featuring prominently”. I’d suggest that the vast majority of YouTube’s content is still people “broadcasting themselves”, despite the (very sensible) moves to showcase professional content too. “This is why the most successful campaigns tend to run across multiple media – each complementing the other, each reaching the target audience in a different context, but all conveying the core message.” – Spot on. At work, we call this an integrated campaign. TV is about as important as recommendation by a friend, while ‘I came across it on FB/twitter’ are very low. Interesting, but I think there could be a bias in that survey against recommendations made online, especially as social networking becomes mainstream and not something people think about as a specific activity (just how they stay in touch with some friends). All in all, a really interesting piece. Well worth a read. 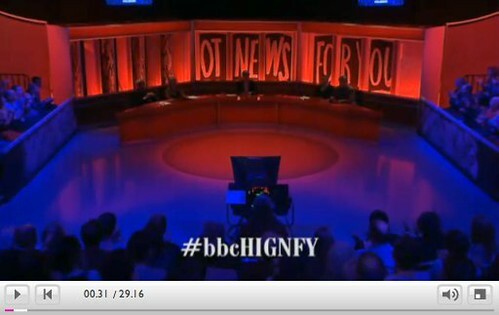 Hashtags on programmes – It’s the bat signal! 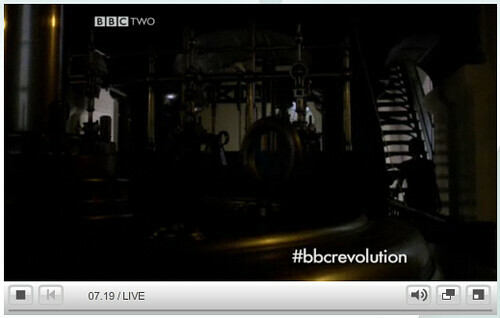 I think that’s quite a watershed moment for the BBC and for broadcasting in general. In fact, the very term broadcasting starts to become redundant when the broadcast is only one component of the entire entertainment experience. What all of these have in common is that they appeared silently, with no voice-over or obvious call to action. It’s a secret bat-signal. A neat solution to a tricky editorial problem. It works for all microblogging services, and doesn’t give undue prominence to Twitter. …while coming just at the end of the credits it’s easily ignored by people who don’t. It doesn’t jar. The visual appearance is tailored to suit the programme, using a typeface which matches the titles etc. …but it’s also a conversation that the BBC is part of. People will spot that we’re joining in too (e.g. 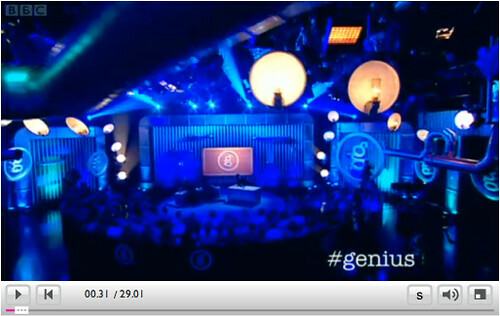 @bbcGenius is an active part of the conversations around #genius, @bbcHIGNFY uses the #bbcHIGNFY tag, etc). The ‘hashtag bat signal’ and the programmes page are not the only way of introducing the idea of a hashtag for the programme (and there are some examples of specific calls to action in programmes which involve hashtags: #askRhod, #bbcFilm2010 etc) but it is an elegant one. Disclaimer: I’m not exactly a neutral observer here. As always, these are just my thoughts and opinions rather than any sort of official BBC line. I wrote last year about the ‘data flood’ that confronts you if you try to watch what everyone on Twitter is saying about the Apprentice. Well, it’s back, and more talked about than ever. This isn’t surprising of course. Twitter has grown a lot since March last year, and people will always talk about what’s on television. The Apprentice, Big Brother, Seven Days and of course the X Factor are all ‘appointment viewing’ shows that are always widely talked about both online and offline. This year, the team behind the Apprentice are not running the same live predictor play-along app they used last year, they’re instead joining in with and reflecting the activity that’s happening on Twitter. Not only is Lord Sugar tweeting personally as @lord_sugar (yes, it really is him), there’s also an official @bbcapprentice account which focuses specifically on the show, doing a good job of sharing news and retweeting interesting stuff while the programme is on and during the week, but also makes use of a often-overlooked Twitter feature, the favourite. The @bbcapprentice account is using favourites to track the funniest and most interesting public tweets they’ve seen, and the official Apprentice site has a little ‘Favourite tweets’ box on the page which showcases them (with deep links to each), with a link back to the full list of their favourites too. As an experiment, I used Twapper Keeper to create an archive of all public tweets using the #apprentice and #theapprentice hashtags. I’ve downloaded the archives and spent some time extracting basic stats and graphs from the results. There’s a lot of data to play with, so these are some very simple highlights. Between 2010-10-6 20:30 – 22:30 there were 23,300 tweets hashtagged #apprentice, 19,782 tweets hashtagged #theapprentice and 390 which used both. Here’s how the two hashtags were used during the evening. The yellow line represents all tweets which contained either #apprentice or #theapprentice (or both). This shows tweets per minute. Both peaked during the boardroom scene, which was also the only point of the evening where #theapprentice significantly overtook #apprentice. Stuart and Dan were the most talked about characters, with Stuart getting some really clear spikes throughout. You can also see ‘sausages’ doing very well during the task, and the “you’re fired” moment quite clearly just before the end. I’ve been thinking about online drama recently. There are traditional online video productions, which are essentially video made for the web. Good examples are Dr Horrible and The Remnants. Both high quality videos made to be distributed online, both created during the writers strike last year. (No coincidence there I think). ‘I Love Bees‘ (2004) was ostensibly a radio drama, but one distributed using payphones around the world which the ‘audience’ became players of a game in order to follow the story. Implausibly difficult for anyone to follow alone, it worked as a community experience with players working together to find, record and share the fragments of story being played through payphone around the world. It was commissioned as a viral campaign for the Halo 2 game. Hear the story from start to finish here, and read more about the background from 42 Entertainment or the predictably detailed Wikipedia entry. “A city obsessed with puzzles and ciphers. A game that blurs the boundaries between fiction and reality.” An ambitious treasure-hunt ARG project, supported by the sale of collectable puzzle cards. Though not necessary to play the bigger game, the cards did provide some of the clues and integrated with the imaginary universe of Perlex City. Particularly of note is the fan-run wiki which the developers ended up relying on as the canonical record of what had happened in the story. ‘We Tell Stories‘ (March 2008) was ‘Digital fiction from Penguin’ built by Six To Start. Incidentally, there’s a long history of Alternate Reality Games being used to extend and enhance TV experiences too. 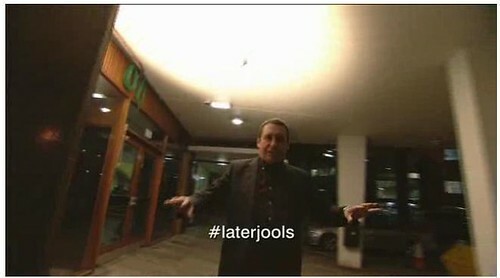 (another Bebo production, this one in conjunction with Endemol. Sponsors include Sony PSP, Trident and Doritos). Freak A Freemantle co-production with MySpace. ‘The first UK online drama from MySpace’. Launch date: 20th July. Brand partners include Tampax and Red Bull. ‘Proper Messy‘ (January 2009) A teen drama from Switch. ‘Psychoville’, exploring the possibilities of comedy on the web, have strategically dropped a few website addresses into their episodes and site, and encourage viewers to explore the web looking for answers to a weekly question. So, not quite an ARG (and actually, I notice that I’ve drifted away from Drama too. Maybe I’ll make another post about Comedy soon), but it is a great way of exploring the world of Psychoville and discovering things like Mr Jelly’s homepage. The results are every bit as darkly funny as you might expect. Going back a bit further, CDX (2006) is an ‘interactive film experience’. (Read an article about it from DigitalArts or a review in Joystiq) hough some thinking about games from the BBC is a post I’ll save for another time. What else? More BBC online dramas: Signs of Life from 2007 (“Buffy meets Horoscopes“), Wannabes from 2006 (” an interactive web-based soap opera“). Torchwood did an ARG and Dr Who didn’t (even though a prominently placed phone number made many of us think they might have). So what about the future? Only time will tell of course. I’m interested to hear of other examples though, and what you think works. And as Suw points out, it’s not as though there hasn’t been any actual research into teens behaviour before now. Suw’s post links to danah boyd a Social Media Researcher at Microsoft Research whose papers are well worth reading her for her well researched and respected insights into teen behavour. There are plenty of other studies too. Nielsen’s report on ‘How Teens Use Media’ [PDF] from last month. It focuses on U.S. and while it covers much of the same ground it backs it all up with, you know, numbers. Going back a bit further, Forrester conducted a survey of European teens for DIUS last year, and wrote it up in a report called ‘How are young people using social media‘. Derek E Baird’s Barking Robot blog (‘musings on Generation Y educational and kids media, online community and youth culture’) is a great resource for people working in those fields. Recently, a post about teens and twitter gave a great summary of various studies and reports too. The music program most popular with teenagers I know is Spotify. With last.fm (Matthew’s choice) it isn’t always possible to listen to exactly the song you want; with Spotify, it is. As a teenage girl who cannot tell Ronaldo from Ronaldinho, I tend not to spend five hours a week watching football. The full article is well worth a look and helps balance some of the London boy centric points. Update: Kevin Anderson follows up with further discussion and more links to useful studies. a creative workshop that defines and develops how the producers channels and rights owners can work with social media platforms to develop business and extend creativity. And generate new revenue streams today! how do we use social media, and what it means. campaigning – e.g. NUS vs HSCB, M&S bra size cost, 13k on FB. There’s no such thing as local news any more. Whuffie: in a post scarcity economy, reputation and social capital rule. people are increasingly consuming an audience online, but how do people find the stuff to watch? ‘ behaviour generated content’ AKA ‘social triggers’: generating user content without having to do anything. e.g. FB activity feeds from status changes. Going from single to married used to be just a metadata change is now an item of activity in a feed. And an important one. realtime-web: co-watching. what are your friends doing right now? 2% creators, 8% particpators, 90% lurkers/passive viewers. How do you move the 90 into the 8 and 2? Joost design based on ‘freedom from choice’, i.e. preventing people feeling overwhelmed. Freak (goes live July 20th.) is a Freemantle co-production with MySpace currently in production (story from Broadcast Now) is the first UK online drama from MySpace. “We’d never let the audience decide the story but how they get there, the everyday decisions, can be affected and influenced by the audience”. producer from Coronation St, director from Hollyoaks, creative prod from serial drama, AP is very young, we have a community manager. Q: how do you work with other social networks? A: YouTube platform where you can view the content too, but the experience is bespoke to MySpace. In the dream world you’d hyper-syndicate and use it to drive back to MySpace. Q: do you need MySpace? A: Brands are nervous about the space, so it’s easier if you have a distributor on-board. Industry needs a gamechanger to prove the model. Kate Modern & Lonely Girl were good examples, but the scale and production values were not there. Q: how does the international model work? A: Not geo-blocked. We’ve cleared the rights internationally, but we’re not going to promote internationally. We think we can take the format to US market or European territories later. Q: who owns the content and format? A: Intellectual Property is owned by Freemantle, but the UK series is co-owned by MySpace. Q: is a TV series on the agenda? A: It’s not the on the agenda, but it’s talked about. Microsoft asked us if we’d go out there and create a social media explosion around Xbox at E3. With 3 weeks notice. Gave us a view of what they’re presenting and announcing at E3. flew 5 influential gamer bloggers and 5 social media power users (including Charlie, to E3). It’s Wednesday, so it’s Apprentice night again. 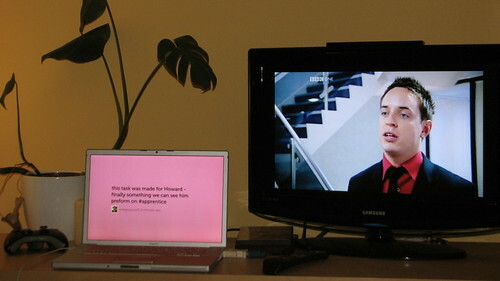 Tonight I’ve been using Visible Tweets on an open laptop next to the TV. Ray was complaining about motion-sickness with Twitterfall running in the background. Visible Tweets (thanks to Andy for the tip) is a nice alternative. I’ve started reading the research paper on User Generated Content undertaken by Cardiff University and the BBC. ugc@thebbc: Understanding its impact upon contributors, non-contributors and BBC News. The study involved 10 weeks of ethnographic shadowing in BBC newsrooms, interviews with 115 journalists and 12 senior managers, analysis of a range of radio and television broadcasts and online content, plus a MORI poll of the British public, an online survey and 12 focus groups. Phew. 63 pages of report means I have not read all of it yet, but Robin Hamman (who was involved in sponsoring the project, has digested it here. Most of it is centered around the use of contributions from users around News, but there are a great many interesting general observations in there, and will give me much to chew over in coming days. And the paper goes on to use ‘Audience Material’ (in preference to ‘UGC’) throughout. Now, I have as many problems with the term UGC as the next person, and it’s not a new discussion, but I don’t really think ‘Audience Material’ is any clearer. Material? It’s no more specific than content really. Just another general word for stuff. Audience? If any word is going to make people at the BBC think of its users as content consumers, to whom we must broadcast, that’s probably the one. Please let’s not reinforce the idea that users are an ‘audience’ or, still worse, ‘consumers’ (as in ‘consumer generated media’. Urgh). I don’t really have a better alternatives, though I’ve always thought that user contributed content was slightly nicer, if only because I like the emphasis on contribution over generation. For the next hour I’ll mainly be watching the Apprentice. Except I won’t. Not just watching anyway. A few weeks ago, I talked about the Apprentice and Twitter and if you’re anything like me, you generally watch TV with a laptop open. This is sometimes known as a ‘second screen’ experience (I even recently heard it called, heaven help us, ‘double dipping’). There are quite a few examples of social telly projects out there, and that list is far from comprehensive. Mac Morrison has been thinking about the web and live TV as an event and reminds us of Tom Coates’ thoughts on social set top boxes from way back in 2005. Well, now there’s this. You might like it. The Apprentice live predictor is quite simple really. You predict who you think will get fired, can change your mind at any time, and score points based on how long you were backing (um, what’s the opposite of backing?) the person who finally gets the finger. It’s not a competition (really), it doesn’t influence the show (it couldn’t possibly, since the show is pre-recorded) and it’s not (really) chat-around-content as some of the social telly examples were, because the messages are pre approved and hand picked by the site editor. That means that a secondary game, which I found myself playing last week, becomes trying to leave a comment witty enough, quickly enough, to get picked by the host/edtior. The predictor is a nice example of participation around live television which isn’t just about adding open chat around a video stream. Fun, game-like elements interest me a lot more really. I think the best bit is watching how the fickle public prediction changes in response to the candidates doing and saying stupid things. It’s been running for the last three weeks. In case you’ve missed it until now, here’s what it looked like during the closing minutes of boardroom scene last week. I waited for a week before posting this, to reduce the spoiler risk.